I admit, I wasn't really prepared for this...work and other issues prevented me from really applying and preparing myself, so right up to the last minute I was unsure of what to play, but eventually ( and judging by post-match chat, correctly ) I avoided my usual 1.e4 and went for 1.f4 : Bird's Opening. Probably my fastest Blitz win -- 9 moves ! After an expected pawn fork with 7...d5 he took the 'wrong' piece. No need to guess what happened...9. Nf6 double-check and mate !! Blitz....so many opinions and I have to say that I agree with most of them. Blitz is nowhere near "real chess", but it is fun and very addictive, and because it often gives you a roller-coaster ride of winning,losing, winning, losing etc, it can be hard to give up ! I get out of that, but make a basic mistake,. 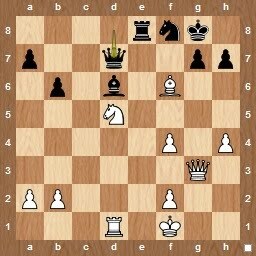 Even though I 'see' the threat, I play the wrong move and go down a piece: its only move 16 ! It takes me until move 35, but I am back in it ! ..and yes, you are correct, the resulting exchange gives me the same position as the previous ( in endgame terms ) but I feel much better. My king is in front of his pawn...it is a draw !! ..the last move ( of 76 !!). My brain tells me its a draw, I know its a draw, but what do I play ? Of course, its blitz, so I play the wrong, Kg8 and lose...so very frustrating, but it is only blitz ! Ah, well, I enjoyed it. What should White play ? ...and played the second best move Bxf6, instead of the better Nxf6+. However I still had a chance next time around after Qd7. Not that I play it as White, but I think its great to see a Grandmaster play an opening as romantic as the King's Gambit. Currently there is a series of matches being played involving 5 of the Netherlands most promising "youngsters" against invited GMs. These include Yasser Seriwan (author of many training books), Lubomir Ftacnik (opening analyst and most recent book "Sicilian Defence") and Nigel Short ( no longer the strongest English GM, but in good form since the Staunton Memorial last year ). As well as two lesser known invitees Sebastian Siebrecht and Dennis de Vreugt. The format is a match of 4 games and Short's first game against (Chessbase's World Cup commentator ) Anish Giri was the King's Gambit Accepted which Giri continued with the relatively rare 3...Ne7. No quick GM draw here, but a fine 59 move game finishing in a Rook and pawns ending. In a surprise second game, as Black, Short played the Benoni Defence against Giri's d4, and although it also was drawn Giri said of it "'I thought, he never plays the Benoni so he knows nothing about it except maybe for something he prepared. I thought I was ok but he had 21.. d5! after which I am worse or maybe even lost. 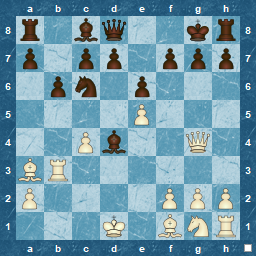 If I could have played a move like Qf3 my position would be fine. So Nigel played a very good game but he just missed Qh6." So what does Short play today ? The Veresov, of course, what could be more natural ! However, the first win from the 'promising youngsters' came from Lisa Schut, beating Siebrecht on the White side of a Sicilian Paulsen, to gain her second ever win over a GM. She apparently didn't know the variation with 7...Nc6 but played well and with 16. f4 produced a slight error from Seibrecht who went down fighting. A first report is here ( in Dutch and with a very 'Bridget Jones' looking Lisa Schut ) and the games are relayed live here . More information on the match here. The last games will be played tomorrow at the Max Euwe Centre. White has just played Bb6. Highlight the solution between brackets.. It might be worth mentioning that I have achieved one of my short-term goals for this month. The T45 round 1 win put my rating over 1500, for which I was aiming by the end of the month. The challenge will be to keep it there ! Next T45 match is against a higher-rated opponent, so probably a difficult one. Looks like he's a Sicilian player too...I know what I will be doing. One small advantage of not playing was that I caught the resignation of the UK Prime Minister live. About time too : the UK doesn't do un-elected Prime Ministers or even coalitions very well, unlike countries like the Netherlands. You can already see the aggressive stances happening, especially out of England. Alex Salmond ( Scottish First Minister ) is quoted as saying that Brown was ""almost a force of nature" in Scottish and UK politics over the past 30 years, and said that "No-one could doubt his powerful intellectual capacity, his commitment, and the strength with which he pursued his objectives." What he doesn't actually say is that it was Brown's objectives that were wrong in the first place. History will have the assessing words, but there might also be an English-reaction this time, if the English ( as opposed to the generic British ) voter feels that there are too many demands on their pockets from the devolved regions of the UK. Expect another election soon, if that happens. Interestingly, for word-lovers, I found out that the term 'hung parliament' has only been present in English since 1974, the date of the last coalition in the UK. Allegedly derived from 'hung jury' but not previously used in English ! For non-English speakers I should point out that its more related to the sense of the word meaning 'delayed' or 'in abeyance' ( another example would be the phrases 'hang back' or 'hang fire' ) rather than that related to a method of execution. Describing an execution, the word 'hung' is not used : a person is always 'hanged', which certainly doesn't have the sense of delaying anything at all. First game of the T45 cycle, and I am lucky enough to be drawn as White against an opponent within 50 points of me, so I was hoping for a relatively balanced game. Checking my opponents games, I noticed that he usually played the Petroff against e4, which didn't excite me, but I thought that it would be possible to switch into something more to my liking if I played 3.Nc3. This is exactly what happened, and after d4, I end up in a Scotch Four Knights so gaining quite a lot of time as he stuck to the mainline for 11 moves : very useful ! What would you do in this position with the move as Black ? Well, my opponent, for some strange reason, resigned ! Not a particularly good game from me. Probably not quite in the mood, and distracted by un-folding events at the public Remembrance Service ( luckily more scary than tragic ) so faced with an highly-prepared opponent ( as I subsequently discovered in chat ), who was also 300+ points higher, the result was predictable. However, I didn't calculate my alternative 13...d5 enough, missing that 17.Bxc3 wins the e-pawn, so I am not level after Rxa5 as I expected. The rest is fairly irrelevant. The intention was to bring both rooks to bear via the a-file, but it didn't work. 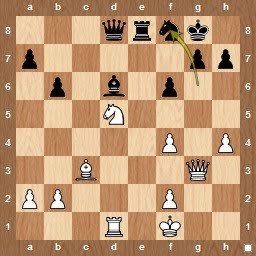 An oversight on move 20 ( how did I miss Bxh6 ! ) sealed an already sad loss, and 25...e5?? was unforgivable ! I will say, that despite the loss, I think I reached the middle-game safely from an opening unfamiliar to me, so effort on planning and calculation is better than a focus on this opening. Hopefully T45 will see me more focused, and playing more appropriately-rated opponents. The new season starts on Tuesday, and I am playing, for only the second time, on the Chessmasters team in the U1600 Division ( Sahara Section ). Surprisingly, and probably by accident, the team is all non-American. Just an observation, since ICC seems primarily a US-based service. Looking forward to it, especially as I am part of the 'default' team. Last season we lost a few games to no shows and team members leaving, so just ensuring we have a full team for each round should give us a good chance ! Feel a bit strange being on 3rd board, as the guys below me are actually higher-rated,but not in “league-ratings”. I don't think it matters that much, as standard ratings vary significantly at my level. What's new ? Hopefully I'll have a chance to try out something different on the White side. Sticking to the same things for Black, as I am quite happy with them. Also a new Monthly standard for May on Tuesday, so looking forward to that too.. This week has the added touch of a mid-week public holiday : Bevrijdingsdag ( sort of this, but more Dutch focused ) is on Wednesday, and due to bizarre calendars its the first time in years that the day has actually fallen on a working day, so it will be a wonderful addition to the week. There is always the rather moving evening before ( Dodenherdenking ) which is a rather personal and often non-governmental/official remembrance time. Additionally, the TV these days tends to show 'Der Untergang' ( 'Downfall' in English ) or a variation of “The Diary of Anne Frank”, rather than the inevitable War-Films that used to be on. Actually, “Zwarte Boek” is the recent Dutch film that makes its appearance sometimes : also a great film, and that rare thing, a great Dutch film ! Regardless, my Liberation Day can also mean a rejuvenation day and with the week after offering a further public holiday and an enforced bridge-day from work, as long as the weather keeps its part of the bargain, the following fortnight will be gratifyingly 'work-light'.